The Spanish press has been full of politicians making comments about poetry recently. Or perhaps not. More exactly, Esperanza Aguirre (Partido Popular, presidenta de la Comunidad de Madrid) picked up on something I think Gallardón (her closest rival, also from the PP) said a while back, and referred to herself as el verso suelto dentro del poema. He dapples into tabby grey. Well, it’s January 7th and Christmas will soon be over. And about time, too. Here in Spain the festivities begin back in early December: the Inmaculada is the 8th, but it tends to link up with the national Día de la Constitución on the 6th and there begins to be a general feeling that everyone’s getting psyched up for the holidays. I’m in the city for a couple of days and spending the morning working at the computer in our fourth floor flat. There’s no one else around and I thought I’d have a few hours of peace and quiet to get the year end accounts organised ready to take to the accountant next week. Instead, it’s only just eleven o’clock and I’ve had to buzz open the main building door three times already – and all for postmen. Well, ok, postpeople, perhaps. It’s nearly Christmas, so it must be time to dust off the decorations. Not for me the tree and the tinsel, the baubles and ornaments that figured so importantly in my childhood. No, since living in Spain I have discovered the art of the Nativity Scene and each year I set out my own small belén at home. 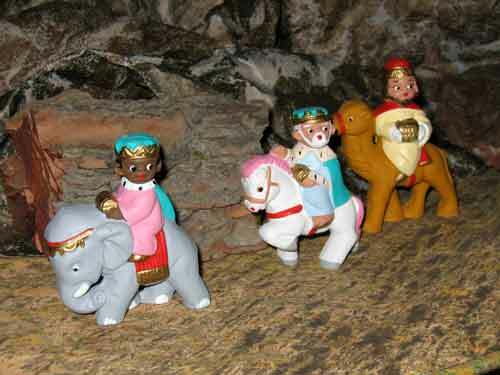 As most people do, I started off with the central stable scene – referred to here as the pesebre (manger), nacimiento (birth) or Misterio (mystery) – but as the years go by I’ve added figures and scenes and now I feel the display really does warrant the term “belén” which is the Spanish name for Bethlehem. It’s Saturday, it’s a public holiday, and I was planning a a long, lazy weekend, starting with a lie-in. 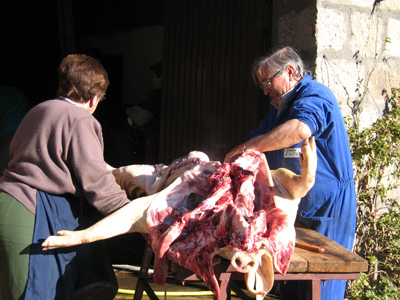 Instead, we were woken around 8 a.m. by the sound of a pig being slaughtered. Actually, I’m not sure the pig itself was making the wheezy, squealing noise: it might have been the donkey disturbed by the proceedings. But whatever it was, it woke me; particularly as the general hubbub was augmented by a couple of roosters crowing, another neighbour’s elderly rottweiler baying – presumably excited by the scent of blood – and the vociferous commentary from four generations of the family who had turned out to witness the event.